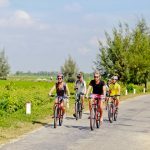 Enjoy the wonders filled with culture, history, and traditional values throughout Vietnam on an unforgettable biking journey of a 2-week itinerary. 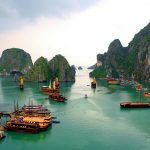 Pedal from Hanoi of old quarters along with ancient villages, see World Heritage sites in Halong Bay and Hue. 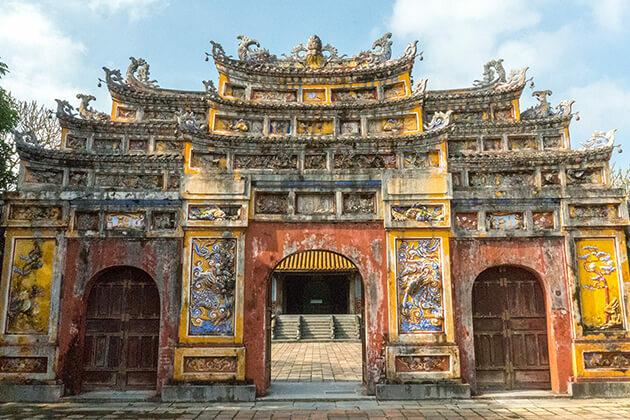 Then venture the charming architecture of Hoi An and My Son Sanctuary together with exploring the natural beauty as well as experience the friendliness of Vietnamese people in Nha Trang and Quy Nhon. 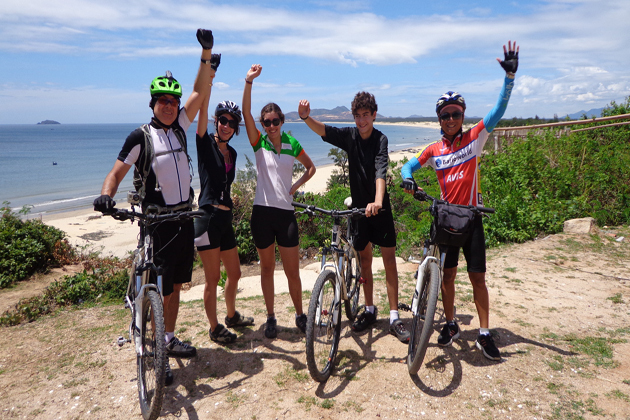 Cycle through the majestic sand dunes in Mui Ne and stop at Ho Chi Minh City of vibrant streets. Date: No fixed departure dates. You may go whenever you wish. Tour Customizable: Definitely! Tell us about your specific requirements. Warmly welcome to our beautiful country! After arriving, our tour guide will pick you up at Noi Bai International Aiport and transfer to the hotel to check-in. Take a short rest to prepare to explore the bustling Old Quarter by cyclo. The Old Quarter is a maze of shopping streets and restaurants with various architecture buildings. 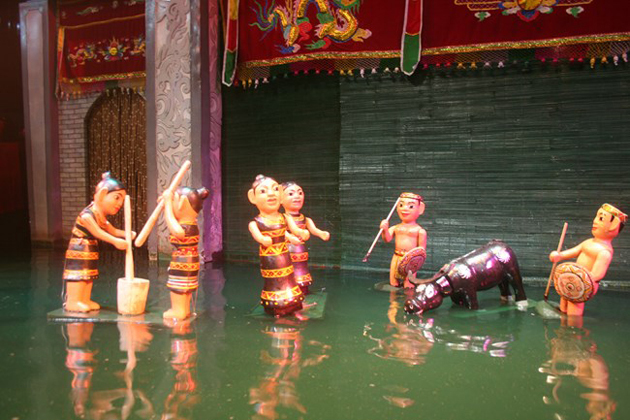 In the evening, let immerse in the North’s rural culture by enjoying a performance of Water Puppetry. Overnight in Hanoi. After breakfast, we will move to Bat Trang pottery village. 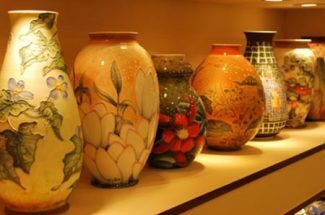 In here, you can observe or experience the creation of ceramic products. 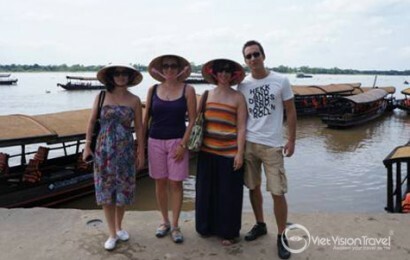 Next, we will ride along the riverside, sightseeing many ancient villages surrounding Hanoi. 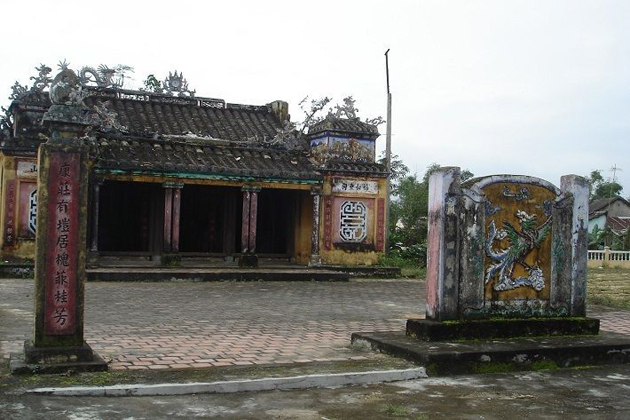 Continue riding to Kieu Ky village which is very famous for making a gold leaf to decorate for pagodas and temples. The next destinations are Dau Keo and But Thap Pagoda. 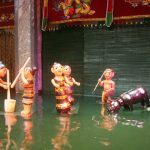 Finally, ride to Dong Ho village, well-known for its traditional paintings. Overnight in Hanoi. 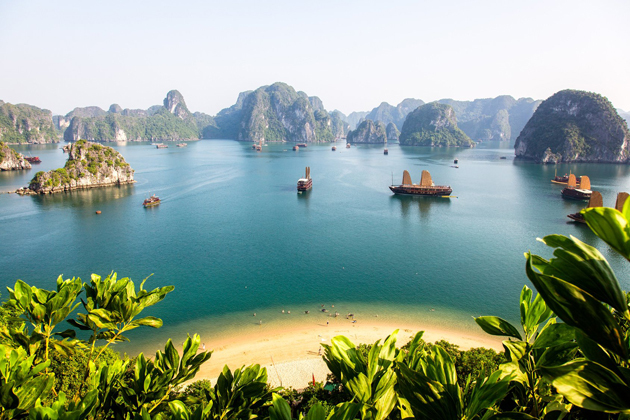 After an early breakfast, we transfer to Halong Bay – one of the most spectacular UNESCO’s Nature Wonders. 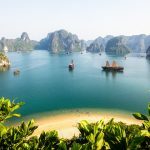 There are lots of things you can enjoy in here like swimming, fishing, climbing to get a hill for a panoramic view of the Bay’s remarkable seascape, or venturing into some of the sea level caves in a small sampan. All your meals will be provided on board, usually based on fresh seafood. Overnight on cruise. The morning is spent on you cruising Halong and join in some interesting activities. Come back to Hanoi after lunch and preparing for the flight to Hue. Our guide will welcome you when you arrive. Overnight in Hue. 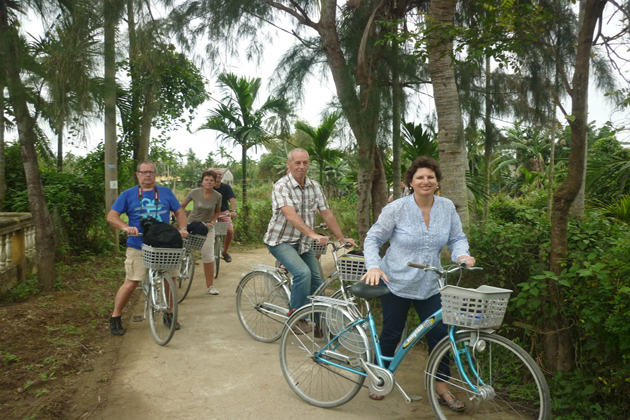 After breakfast, you will get on your bicycles and ride through Hue’s rural villages towards the Thanh Toan Bridge. Nearby, a local market will provide you with views of daily life and local products. 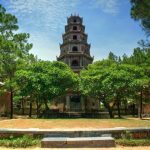 The next destination is the Ngoc Son Princess – one of the traditional garden-house in Hue built in 1921 under Khai Dinh King period. After lunch, we will visit some of the garden houses in Phu Mong Kim Long village, followed by a visit to the Thien Mu Pagoda. 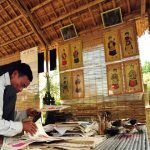 Next, crossing the river by boat to ride along a country lane to a handicraft village with special products – ‘Huong Tram’ (incense sticks). In the evening, you’ll enjoy dinner with traditional Hue cuisine in the pleasant surroundings of the garden houses. Overnight in Hue. 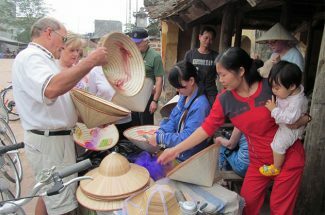 After breakfast at hotel, you will on the way come to visit the Phuoc Tich Village. 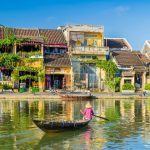 The village is situated beside the O Lau River, one of the biggest rivers in Hue, it’s known for its ancient houses built more than a century ago. Arrival, we will explore ancient houses which reflect the architectural and cultural characteristics of the region. 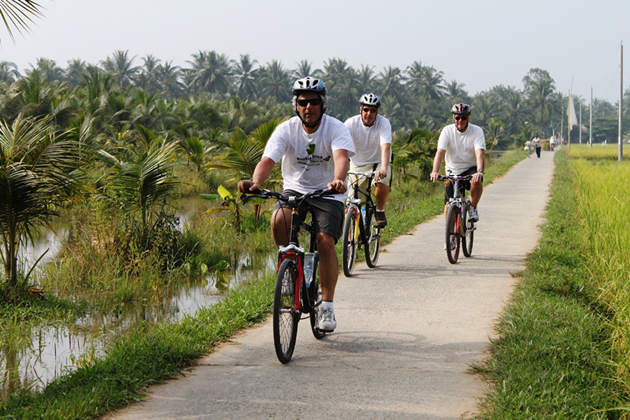 You’ll then cycle along the river to experience the rural scenery and daily life of the villagers. Overnight in Hue. 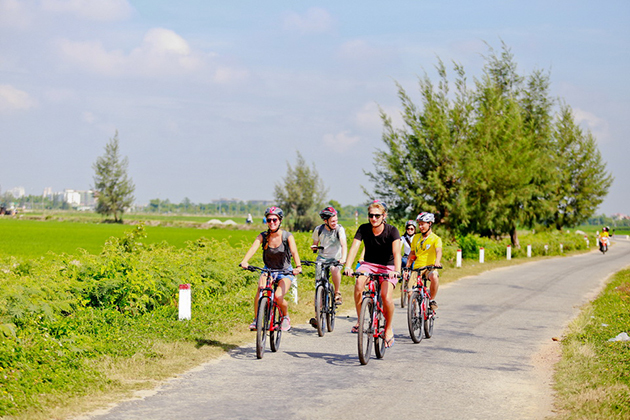 A classic cycling trail for people with average fitness, driving to the coast, about 18km beyond Hue’s city limits. 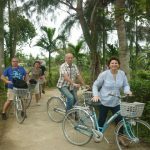 Immersing in nature with a picturesque lane shaded by coconut palms running alongside a peninsula from Thuan An beach to Vinh Loc. Reach the end of the peninsula, a local ferry will take you across the Perfume River’s estuary, after reaching dry land, the route takes you a further 11km arrive at Highway 1. At this point, you have two options – brave the traffic on Vietnam’s busiest road or be transferred to the start of today’s three hill climbs. After the first two moderate climbs, we will take a break to prepare for the Hai Van Pass. 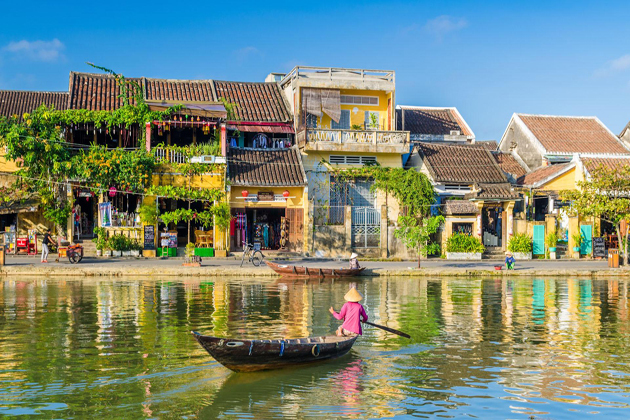 Finally, you’ll then be transferred the rest of the way to Hoi An Ancient Town. Overnight in Hoi An. A gentle ride westward to the World Heritage My Son Sanctuary, mostly on quiet level roads following the banks of the Thu Bon River. Seven kilometers after setting off, you’ll cross the river to visit a fishing village. After remounting and dropping in at a local market, a further 11km takes you to Bara Bridge for a short break. You’ll need to push your cycles across a couple of major roads, then it’s more back roads until you reach My Son. 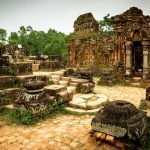 Your guide will show you the remains of the remarkable towers constructed by the Cham builders, many centuries ago – their origins and purpose have yet to be fully explained. Overnight in Hoi An. After a hearty breakfast, you’ll drive to Quang Ngai. 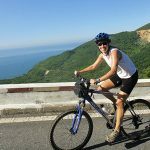 The first stage is gentle – quiet country lanes leading to the coast and fishing villages. 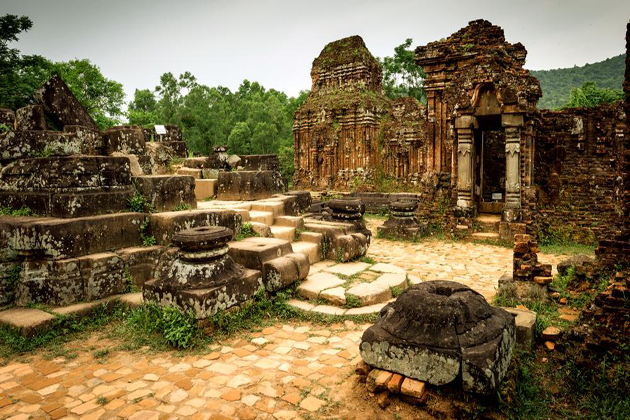 A short 2km ascent to the top of Thien An Mountain provides striking views of the surrounding countryside with time to visit an ancient pagoda dating back to 1650. The gradient is now downhill towards the site of the infamous My Lai massacre, now a shrine dedicated to the unarmed 550 villagers, mainly women and children, slaughtered by the Americans in March 1968. After a guided tour to reflect on the war, the quiet roads take you to the beach for relaxation. After a picnic lunch, you can loop around through the fishing villages to return to Quang Ngai. Overnight in Quang Ngai. 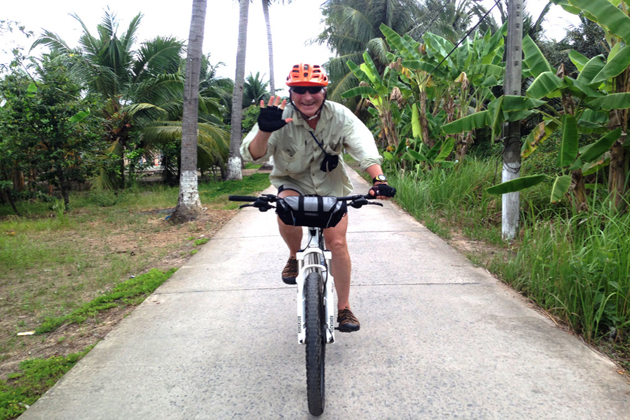 After breakfast, cycling begins at 99 KM South of My Lai. 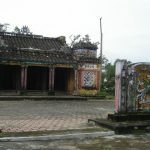 The first section meanders alongside the coast from Binh Duong, Tung Giang and Tuy Phuoc on a small provincial road passing many villages, far from the main highway. 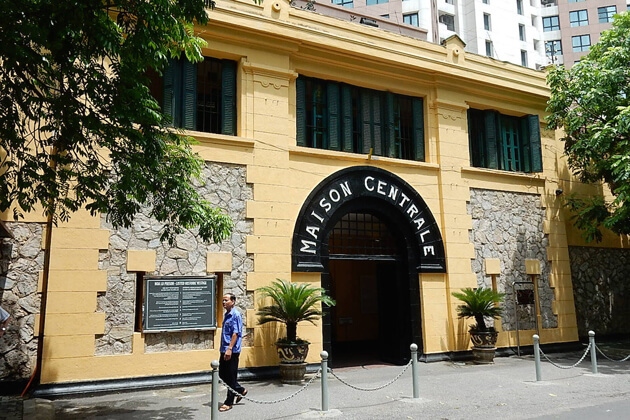 There’ll be plenty of time to dismount to experience the warmth and friendliness of Vietnamese people. 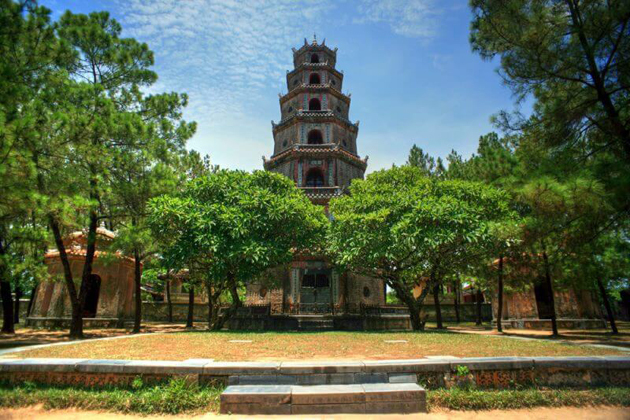 Eventually, you’ll arrive at Tuy Phuoc, 9km to Quy Nhon City, your destination and accommodation. Overnight in Quy Nhon. After breakfast, we on the way come to beautiful city Nha Trang. 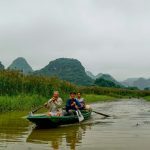 The gently rolling terrain and views of the Highland foothills make a splendid backdrop for the potbellied pigs and barefooted children dashing across your trail as you pass ethnic minority and Vietnamese communities’ en-route. Arrival in Nha Trang, Dai Lanh Beach can be an ideal place to relax. Overnight in Nha Trang. As usual, you’ll drive to the outskirt of the city to avoid the traffic. 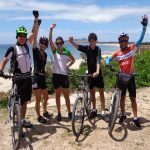 Once on your cycles, the route continues southward towards Cam Ranh until you join Highway 1 and dismount. After driving to Ca Na for lunch, you’ll drive to Luong Son, where you re-mount. Continuing move to Mui Ne, check-in the hotel and the rest of the day is spent for relaxation. Overnight in Mui Ne. 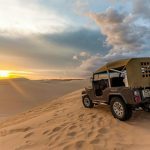 After breakfast, we start our Mui Ne Sand Dune half-day tour by jeep. The first destination is the Fairy Stream where we can’t miss in Mui Ne. After that, we visit the Yellow sand dune. We will discover the daily activities of the fishing farm. 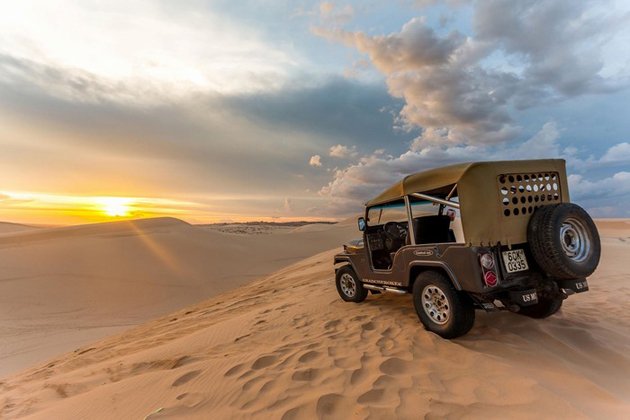 Not only visiting white sand dune, but we will also be fulfilled by the beautiful white sand dune. After that, we will get on our Quad bike (ATV) for a 30-minute ride around the vast dunes from the foot to the top of the dunes. We then drive back to our hotel and have free time at beach. Overnight in Mui Ne. Your time will be your own until your driver arrives to take you to Ho Chi Minh City in good time for your departure flight. 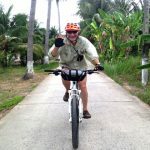 Vietnam Cycling Tour Itinerary 2 weeks ends.